The newly created Valley Twang Cooperative is bringing a night of local roots music to the Iron Horse Music Hall on Friday featuring three bands. 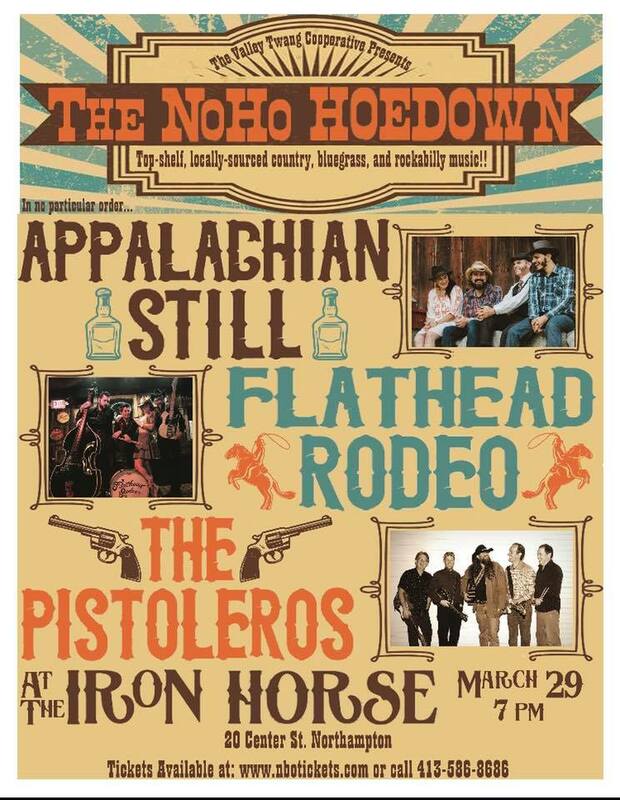 There’s rockabilly/ country group Flathead Rodeo, Americana acoustic string band Appalachian Still, and rebel country group Josh LeVangie and the Pistoleros. If I wore a hat, I’d have to tip it to the Valley Twang Cooperative for promoting roots music in the Valley. Iron Horse Music Hall, 20 Center St., Northampton. 7-10 p.m. $20 general admission plus online fee. “Nothing happens, nobody comes, nobody goes, it’s awful!” While that line by one of its main characters has come to be known as a description of the play itself, “Waiting for Godot” still manages to be very entertaining. And realistically speaking, who can portray nihilism and existentialism better than a bunch of high school students? Northampton High will be putting on the production on Thursday, Friday, and Saturday at 7 p.m., with a Saturday matinee at 2. 380 Elm Street, Northampton. $8 general. $5 for students. For more information, email estherdv19@gmail.com. I’ve always had this fascination with mannequins. The beauty behind these lifeless pieces of material have always sparked mysterious stories in my head. I painted a mannequin bust about 15 years ago that I’ve cherished and call Uma, simply because when I put my black bob wig on her, she looks exactly like Uma Thurman’s character in Pulp Fiction. When we were putting together the re-launch issue of Preview Magazine, this exhibit was featured as the cover story — I was in awe. The images that Brooklyn-based artist Martine Gutierrez has compiled of her mix of living and life-like figures are creative and beautiful. “Life/Like: Photographs by Martine Gutierrez” artist talk: Thursday, March 28, 5:30 p.m. On display through June 16. Mount Holyoke College Art Museum, 50 College St., South Hadley. artmuseum@mtholyoke.edu. 413-538-2245.